I still have nothing more to say about the flowers from yesterday. I want to talk about the bees, starting with the cuckoo bee up to its neck in dandelion. Like the birds, they lay their eggs in other bees nests so carefully dug and provisioned in the ground. I’ve seen them before, tiny reddish bees flitting around the dandelions. About the best you can say as that cuckoo bees mean there’s lots of host bees for them to steal from. 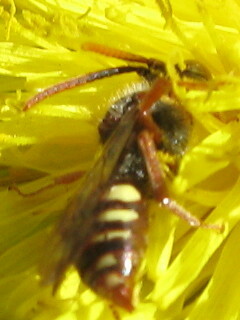 These are of genus Nomada and they prey mostly on Andrena, and yes, there are even more of them around. 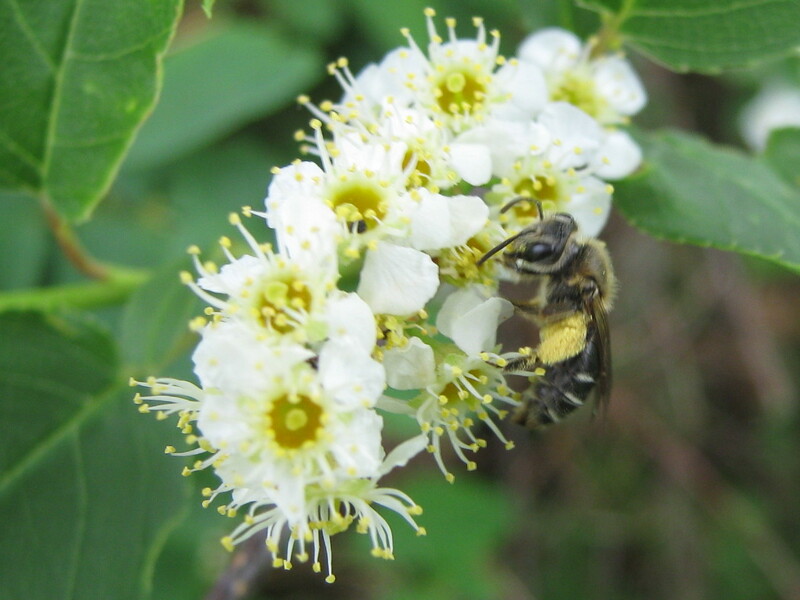 Andrena are mining bees, and I see lots of them zooming around the ground. Lately they’re all over the pretty little bush in the corner quietly flowering in sprays of white flowers. Every year I see more bees dancing with it. And no wonder. Look all the pollen she’s packing. And every year I think, what’s the name of that bush again? Sweet something. Sweet bush? Virginia sweetspire! Not all the little bees are Andrena. 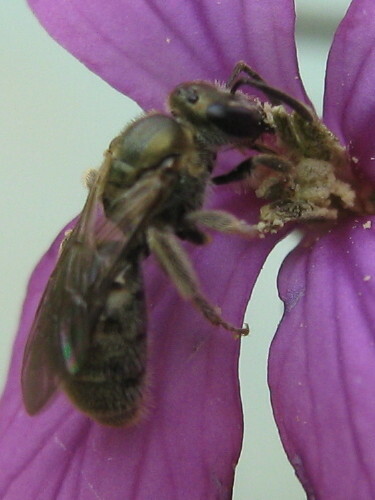 This is a glossy little sweat bee of genus Lasioglossum. The bright purple flower will ripen to a flat round coin. Just the the thing to scatter on the ground and see if anyone picks it up. That’s why it’s called honesty.